All that freshers who got placed last year are concerned about now is their joining date. Offer letter has been already provided early this year. It has been just a few days since our semester exams ended. Results are soon to be declared within a few days. Me and my friends who got in TCS are all waiting when we will be contacted for our medical tests, a routine followed by TCS every year. Things are looking pretty good with respect to financial condition of TCS as they recently recruited about 250 freshers from the 2010 batch for their Cincinnati branch. It’s a matter of time now till we get our medical tests done and get our joining letters. From various communities and discussions by TCSers it seems joining won’t be before September or October 2009. Till then it’s time to do something like revising old stuffs and learning new stuffs with renewed vigor and energy, as it’s entirely up to us how we utilize our time now. Many of us are enjoying merrily playing cricket and football matches and having the time of their life, a fresh beginning, a transition period, a never-before-experienced phase between our academic and professional careers. Really looking forward to utilize this time in really creative useful positive way for personal growth! Google Reinvents Email, Docs with 'Google Wave' !! What would e-mail look like if it were invented today, rather than several years ago? Here comes Google Wave, a preview application shown off at the Google I/O conference. Below is the video which would give the users a cool idea of what this is about. The Google Wave site is now up and running, although access to the application will be restricted. 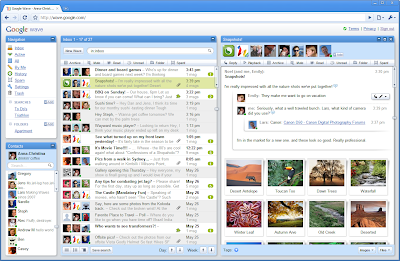 Google Wave was developed by the Google Maps team. Firstly I would like to share the Fan Community of Wolframalpha !! The problem with the web today is, it has no idea what the hell you’re talking about! It doesn’t understand what you are asking of it. Search for an artist you like and you’re OK but ask it “what was the highest temperature in Kolkata week”, and it fails embarrassingly. A new technology Wolfram|Alpha, a system which is capable of computing answers to questions is likely to be launched this year.So the web is expected to be smarter by the end of this year. However it isn’t limited to any field or type of question. It actually understands what you are asking of it, and computes the answer! It is like as calculator which can give you answers to questions like “What was the length of the longest whale discovered in the pacific ocean between the years 1900 and 1990”. It doesn’t come with preprogrammed questions; considering the scope of the questions it aims to answer, that would be almost impossible. Instead, the developers have actually generated models of the kind of factual questions that it may be asked, and broken them down into units that can be computed. The potential of this system is limitless, but it itself is not. It doesn’t not plan to give answers that may have multiple opinions, just for facts so don’t expect it to answer question on anything like “Should I marry my boyfriend who has been with me for the last three years, but we broke up for like 3 months in the middle, and he didn’t even call once! Well actually he did, but I wasn’t there, but he didn’t call again! So should I? ”. This means the system has less chance of being biased, i.e. having answered based on the opinions of the people who are entering the data. This also means that it can only supplement Google, not replace it. It may never be able to rule the world, but I’m pretty sure it will rule the web! If your brain works normally this is neat. This is another example of an amazing illusion!!! The last sentence is so true. If your eyes follow the movement of the rotating pink dot, the dots will remain only one color, pink. Now, concentrate on the black "+ " in the centre of the picture. After a short period, all the pink dots will slowly disappear, and you will only see only a single green dot rotating. India’s biggest software exporter by sales, Tata Consultancy Services (TCS), will lay off less than a percent of its global workforce over the next few months, as these employees failed to meet performance standards, a company spokesperson said. This roughly works out to 1,300. The company has a total employee count of around 1.3 lakh. I wanted to share this awesome article written by my friend Somdas on his experience during the Graduate Aptitude Test in Engineering 2009. He ranked a stunning 87 and is invariably a role model for all examinees. Right now though he’s busy with IIT-Delhi. “GATE is an All India Competitive exam conducted by IISC and the IITs for admission in various post graduation courses in the field of engineering and science. So if u are interested in doing Mtech from these institutions then GATE is a must for u.
I decided to take this examination the moment i took admission in Under graduate college for Btech!! It may sound strange that before even i began studying for Btech , i started thinking for Mtech. But it was planned by me to try to go for Mtech from IITs. The reason was simple - I always dreamt to be an IITian. After i started studying for Btech , i developed the love to study subjects related to computer science. This further increased my hunger to go for Mtech... the intersest to study computer science. I deceided to appear in GATE 2008 as the GATE score was valid for 2 years. I didnt have much preperation going into the examination . I gave the exam just to know how much tough it really is. The conclusion i got was that if i study a little harder and in a planned way then cracking GATE 2009 might not be difficult. That year my rank was 1904. The preparation for GATE 2009 began after i got placed in Infosys. That gave me a huge amount of Energy and boost to study for GATE. I took admission in Gateforum , a coaching institution for GATE. Two of my friends also joined with me. I started regualrly attending the classes. I also started preparing slowly and steadly . What it did was it moved me away from the semester exam study and made me concentarte on GATE related study. More than what they taught there , the practice and staying in touch was more important for me. The person who lifted my study for my GATE exam was our TOC and compiler teacher. I was weakest in these two subjects , but the way he taught us these subjects was simply superb. Eventually TOC became my strongest point! But more importantly he gave us huge amount of confidence and self-belief. Also the most important point that i personally picked up from his lecture was to go for a plan study. He discussed with us how he planned his study. I would like to discuss this issue here. He showed us a notebook which was divided into 8 parts each for one module in GATE. In each part he noted down some problems and important points that were most important thing in that module. And he believed that if he practices those problems and remembers those important point and tricks then he can solve any problem from that module. He believed that 20-25 problems from a single mdoule was more than enough to cover the total module. Also when we asked me to give us that notebook he warned us that these notes will vary from person to person!!!! !I found this concept and idea an interesting one. I decided to follow his plan ... and i must say it really worked for me also. This planned study saved a hell lot of time. Also another thing that he did was prepare a one page note on some of the subjects. The objective of this plan was to study the important facts and tricks the day before the exams quickly , and doing so will save a hell lot of time. After all the study it was time to sit for a series of Mock All india Tests. The tests were conducted by Gateforum. These tests were extremely useful for all of us. I must say that it played the single most important role in getting a decent rank in GATE 2009. In fact one of my friends didnt ever study for GATE. He appeared only the test series and guess what he was able to get rank 57! The reason for this is that the test series constantly showed where we stant in the competitition . We were told that if we are able to secure a rank of within 20 in these exams then we will surely rank with 100 in GATE 2009. Also these exams helped us in stay with constant practice . Even if u didnt study previously , here we solved problems of all kinds that covered all the areas. Also the discussion among my friends after the exams was very very important. We were able to discuss various tricks and ways to solve the problems. These helped a hell lot. The final one month before the exam was all about constant practice and nothing else. Totally dedicated towards GATE study and nothing else. Finally the examination day came. I was surprised to see such easy questions to begin with. I became too relaxed and started solving problems slowly and steadily. And that was the mistake i made. In the end there were some tough problems and i struggled to finish off the paper. I made a total mess of the whole exam. To make it worse when i discussed the answers with my friends i found out that i made about 8 marks of silly mistakes. All my hopes of studying in IIT was completely gone. On march 15th the results came out. I was surprised to see the rank(87) that i eventually got.Two of my friends got 37 and 57 rank. I was extremely delighted to get this rank. At the moment i am hoping to study in IIT and fulfiling my dreams. To succeed in GATE u must be truly interested in pursuing Mtech. U must have high interest in computer science. I have seen people who dont have some much love for the subject but want to pursue Mtech. U are bound to fail in such case. Participating in some all India test series . I gives u constant practice in the last 5 months. Extremely useful. Also shows u where u stand and how much u need to work harder. There is a myth that u need to study the books that toppers study. This is compeletely rubbish. One should study the books that he or she is most comfortable in. I didnt have any book for many subjects. Forget ur semester exams and all. Just concentrate on the GATE related study. The CGPA matters liitle(it only plays a significant role in IIT Delhi). A planned study is essenstial as i described above. One of the first phases for candidates joining this reputed organization is undergoing a training program called ILP. There are lots of materials found in numerous blogs and orkut communities with thousands of members sharing these. However, it's not appropriate to share the same publicly. So here's a small collection of materials from public domains which will be useful. Kindly refrain from posting your email ids below. Simply click here to download the materials. These files are in no way related or distributed by TCS, but are only related to concepts and topics covered. There are lots of other materials available everywhere as well but these few ones should suffice for quite sometime. There are a lot of technologies around so prepare yourself as much as you can. All the best! I am myself not a very great fan of wallpapers and screensavers, but this Vista craze brought me down. I really had a difficult time searching across various Vista themes and finally came across these two. Thought like sharing with you. As shown beside, the Vista theme on installation and makes your desktop look like this. There are a few more Vista screensavers also, like the Aurora, Ribbons, Mystify and my favorite one, the Bubbles. Here is a snapshot of what the desktop becomes with the bubble screensaver. Click the links above to get them if you want. Or try this link. Gotta go now..Bye!